George was a founder member of the Society founded in 1969, then known as the Wrekin Amateur Radio Society. At one time very active on the amateur bands, due to declining health, he was no longer heard on the air. George lived on the Dawley Road in Wellington, and was well known in the district, having once served in the Parachute Regiment. He had an extensive family, including great grandchildren. George died aged 92 years. Pete was a member of TDARS for many of its early years, and was on the committee of the Telford Rally Group. He enjoyed all aspects of the hobby, and was active on both HF and VHF. His garage and shack in Wellington were full of miscellaneous radio and electronic oddities. He was an experimenter. Pete’s selling ability at Surplus Sales was legendary. A few years ago he had a stroke which prevented him from operating. His career was as a pharmacist, latterly in Boots in Wellington until he retired. Pete leaves his wife, Rosemary and three daughters who were very fond of him. .Jim came to live in Madeley in the late 70’s, joining the Shropshire Fire Service. Shortly after, he joined TDARS, becoming the Society’s Hon.Treasurer in April 1983. He gained his callsign G8UGL in 1979, and later added M0UGL following a successful morse test. Jim remained a highly respected member for 40+ years, and only resigned as Treasurer early in 2018 when his health began to deteriorate suddenly, and rapidly. Jim loved portable operating – whether in the hills of Shropshire or some other far flung location in Guernsey, Cyprus or the Scottish Isles; he was often the ‘voice’ of G3 or G6ZME/P. The voice/data Repeater GB3TF was largely run and updated by Jim.He had a relaxed, friendly manner, but also gained a reputation for destroying camping chairs and loungers when camping in the hills! He was very well organised and his garage and shack were a real Aladdin’s Cave of electronic and radio equipment. Jim’s presence will be sorely missed by family, friends and TDARS members for many years to come. .John lived in the Madeley area of Telford. He was an active member of TDARS when meetings were held in the town itself. He had plans to become more active in 2017, but had not been heard for quite some time before then and until his passing. .Bill was a club member from its earliest days at Ketley Bank, followed by The Phoenix School, Dawley Bank and up until a short while before his death. He was a kind, friendly man who spoke quietly and sincerely, making new amateur radio friends almost daily on 2 metres and other bands. For many years he worked for BT out in the field in the local area. Over the years, he introduced several current club members to the hobby, even though he had not attended himself due to his age. He was still active in his eighties and early nineties, but the last year or two was spent in a Wellington care home. Bill was a fine gentleman. 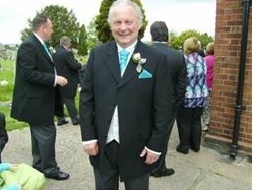 .Ray lived in the Wellington area with his partner Debbie. He was intending to join the Society, but left it too late as fatal illness overtook him just before he joined. He was active daily on the VHF bands, and listened on HF too. He enjoyed the experimental side of the hobby, repairing rigs as well as operating. He once wrote: ‘Life is amazing. And then it’s awful. And then it’s amazing again. In between the amazing and awful it’s ordinary, mundane and routine’. .Dave was a member of TDARS for several years, but rarely came to club meetings. However, he was active most Sundays on 2 metres FM on the Sunday evening net, and always had a friendly word or two with fellow club members. Gordon Pooler G0WQH died at the end of August 2017 after a lengthy illness. Many members will remember Gordon for his weekly cuppa and for his endless friendly chat at TDARS. Active at one time mostly on VHF, Gordon joined in the local Sunday evening club net, and involved Charlie, his daughter, in his radio hobby interest. One of his stories was how he and Charlie would tap out morse at the dining table having a private conversation. Gordon died aged 74 at home with his family. Derick had a radio and TV shop in Newport for many years, and was a close friend of Syd Poole G3IMP. He was a helpful guy with a wry sense of humour. He belonged to TDARS in the early years, always willing to give sound advice to newcomers to the hobby. Derick’s main operating was on the HF bands, but he was also heard on 2 metres. He supported charities such as the Newport Rotary club, of which he was a founder member. He died suddenly aged 82 at home whilst on his flight simulator. Until recent years, John was active on HF and VHF, both from his home and an alternative coastal site in Pembrokeshire, S. Wales. He took a particular interest in Amateur TV, and held a 10GHz TV Repeater Licence for several years, taking advantage of his superb QTH in St George’s to send and receive excellent TV pictures. He was a member of TDARS in past years, and helped many local radio amateurs in whatever way he could. Until he retired in the 1980’s, he had his own transport business with local contracts. Other hobbies included motorcycles and 4X4 vehicles off-road. He was a Parish Councillor for 25 years. John died at age 69. Albert suffered from serious ill health over a long period and was unable to come to meetings of TDARS. However, he took a great interest in the activities of the Society and had a VHF station and joined in the Sunday evening 2 metre nets in past years. Albert was a quiet, friendly gentleman who had a career background in engineering, including work with companies like Plessey. At one time he became a successful joint owner of a hotel in Tywyn for a period of about eight years before returning to live in Shrewsbury, where he finally died, aged 84. Phil Ealham, 2E0GIV died unexpectedly on 3rd November 2013. He is remembered for his quiet but insightful outlook on amateur radio and life in general. He was active mostly on 2m and the 80m Monday/Friday 3657 KHz nets and an active member of the local RAYNET group. Phil enjoyed travel abroad and had planned to visit China and Hong Kong before his untimely departure. Ray Johnstone G3XQL died on 25 April 2013, aged 79. He was a committee member of the Wrekin Amateur Radio Society in the 1970s before the name-change to Telford & DARS. He was rarely heard on the airwaves, but memories of an enjoyable WARS Bonfire Night one November evening at his home in Withington come to mind. He and his wife Margaret were excellent hosts and Ray was a kind and thoughtful gentleman, who contributed much in the early days of the Society. John McFall, G4HFX, Died 9th March 2013 in Shrewsbury, aged 96. John was an enthusiastic TDARS member for many years and served on the committee as Hon. Secretary for a number of years. As a retired Planning Officer (N. Shropshire), he served on the RSGB planning advice committee, and helped many local amateurs get permission to put up their dream mast or tower. His calm, quiet manner gained him a great deal of respect in all quarters. Fred Campbell 2E0ANU of Meadow Close, Trench passed away on the 7th February 2013. He was an enthusiastic member of the Society, and one of Mike street’s (G3JKX) earliest Foundation Licence candidates. Ill health restricted his Amateur Radio activities, and attendance at weekly club meetings, but he as been a keen listener in past years. Ray Watson passed away on 12 March 2012, aged 85. He had not been in the best of health for a numbers of years and lived alone, his wife having passed away in 2004. For the past 10 years Derek G0EYX brought him to the club as he was not allowed to drive. He and Ray Corbett often sat beside each other on club nights. Ray was not active on the bands preferring to be a ‘listener’ rather than an operator. He and his grandson, Robert, obtained their ‘Novice’ licence in the early 1990s at the Stafford Club. Charles (John) Tranter, G3BQQ, sadly passed away on 13 August 2009 aged 88 years. His only son Nicholas gave a potted life history at his funeral service held recently at Christ Church, Wellington, where some sixty mourners gathered. TDARS was represented by myself and Dave, G8VZT, who knew him. Trained as a chemist, Charles worked for British Sugar at Allscott prior to and after the 2nd World War. He was a fluent speaker of German and French and joined the RAF, training as a Wireless Operator/Air Gunner and ending the war flying in Lancaster bombers. In 1945 he returned to his duties at Allscott but now had a love of radio communications and obtained the callsign G3BQQ in 1948. He had several periods of inactivity on the air but on retirement in 1984 gave his amateur radio more time until about 2002. He was adept at making his own electronic equipment. Charles was also a very good rifle shot and after-dinner speaker and lecturer. RIP. Mike passed away suddenly just before Christmas 2008. He was quite active both on HF and the 2 metre bands. He was a widely known and respected member of Telford & District ARS, attending meetings regularly right up until his sudden and unexpected illness. He led the Society as its Chairman from December 1971 until April 1977 and was on its committee for an even longer period. Some early social events took place at his QTH and he was a most friendly and thoughtful character. Stan G4LU, C.Eng., M.I.E.E. MBE died peacefully on Wednesday 14 May 2008. Stan was a very active Radio Amateur, and although not a member of TDARS, he gave several excellent illustrated talks to the Society over the years, drawing on his vast professional experiences as a communications engineer. He was remarkably fit, and had many outside interests, including local politics. He was Mayor of Oswestry from May 1998-1999. Roy was not a member of TDARS, but nonetheless was a good friend to the Society. In particular he supported the annual Telford Radio Rally through his RSGB connections. He was a RSGB Regional Manager for the Midlands for several years, and put himself forward to be on its Council Board as late as autumn 2007. Roy ran an excellent website that covered his joint interests of amateur radio and amateur astronomy. Eric died aged 70 on June 12, 2007 at the Morris Care Centre in Wellington. Eric was a member of TDARS for several years. He lived in Randlay, Telford, but moved to Wolverhampton. He enjoyed several winters by renting property in Spain to avoid our climate! He was a popular bloke, with a droll sense of humour. He mainly operated on HF, but hadn’t been heard on the air in recent years. Rob died suddenly on Tuesday morning at 56. The Linney family were strong members of Salop ARS. Pop Linney was a past president and Robs elder brother Ken is active on various bands and modes. Rob was active on 4 m.
Peter died suddenly on Tuesday at 69. He was a member of Salop ARS for many years. He was a skilled engineer and built or modified PMR radios for his use on Amateur Radio . He also had a keen Interest in Photography. John was a member of TDARS until his death at age 63. For many years he paid for Club Newsletters to be posted to all Members via his business, Madeley Dental Practice, of which he was a senior partner. He had not been active on the airwaves since the 1980s, but still pursued a wide range of hobbies, and was an extremely nice guy. John Hartley, G8AEV, died peacefully on Tuesday 25th October 2005. He lived in Much Wenlock. He was very much a loner, but will probably be known to some of you as the fella who sold electronic components from the top storey of a shop in Bridgnorth for umpteen years. He always seemed to have Radio 3 as company. He was the creator of the G8AEV 2 metre converter when that was a novel concept for VHF receiving (late 1960s ?). Roy Davies G3MVK died suddenly and un-expectedly on Saturday 18th June 2005 at home, following a relatively straight forward hip replacement operation just a day or two earlier. This came as a great shock to everyone who knew Roy. He was a thoughtful and kind gentleman and a first class operator on various amateur bands, notably being the usual M/C for the Sunday evening Shropshire RAFARS net on 2 metres. Although Roy was not a member of TDARS, he lived in Newport and was an active member in Shropshire RAYNET. Ivor was a very generous man who discovered amateur radio through CB. He enjoyed all aspects of the hobby, but is remembered especially for his outstanding engineering skills, which he used for making almost everything: – masts, antennas, morse keys and even two microwave omnidirectional slot antennas used on the GB3ZME (Telford) and GB3KEU (Sheffield) 5.7 GHz propagation beacons. Many people came to know him through the practical help that he freely provided. .A very active member of Salop ARS, and supported every radio amateur and SWL in the county. He worked for Pye Communications for a long period of his working life, until retirement. G3BOC Harry was a very amiable fellow, and very active in Amateur Radio, on most bands up to 1296MHz. His other hobby was flying his own private plane. A couple of times he flew up to a Scottish island to join up with a TDARS expedition, including a trip to Jura in 1990 when he slightly bent it whilst taking off. Happily, no one was hurt, but the Cessna had to be shipped home on the ferry and by road. Tony, G3DMC was a quiet, friendly man who operated on a number of amateur radio bands, nearly always using home constructed equipment. He joined the Society after retiring from COD Donnington. Tony was a meticulous maker of anything electrical or mechanical, with a fully equipped workshop in his converted garage in Trench. He often helped and advised TDARS members in their own projects. G4IUT Gerry lived with his wife and family in Tibberton. He was a very enthusiastic member of TDARS, coming out on numerous field days and outside trips. He was an excellent operator, in particular always willing to help younger members of the Society. His degenerative illness was sudden and painful, although he took and operated his radios in a Wellington Nursing home almost to the end of his life. Chris used to work as a welder, had worked in the UK and in the Middle East.. Chris was a keen VHF DXer, an active member of RAYNET. He would be found rag chewing on 2m most nights, or working 2m DX with his formidable 2m station from Hadley, (IC-970H and a 17 element boomer). A very friendly guy that would do anything to help anyone. G1 JNZ Eddie Lee . .Eddy is the reason I became a radio amateur (G1MHU) . He was a family friend; one evening he and his wife Joyce were visiting my house, he suggested that I visit TDARS some time as he knew I was very keen on the technical side of radio, and that they were soon to be running a RAE exam course. He was a very intelligent, kind and gentle guy. He participated in many club events, and was a keen member of RAYNET (think he was controller for a while). He held the position of club secretary for a number of years.He had two sons Andrew and Richard. G3IMP Syd was licensed in the nineteen fifties, and joined TDARS in 1983. Such was his popularity and natural leadership that he soon became vice-chairman, and finally Chairman from 1985 to 1990. His infectious enthusiasm led to many others joining the hobby and the Society. He never rested on his laurels, and was one of the first local radio amateurs to connect his radio transceiver to a computer, and to transmit data around the world. Syd was a top class operator and used the hobby of amateur radio to extend a warm hand of friendship at home and abroad. He became County RAYNET Controller (Shropshire) for several years. He was also the RSGB Regional Liaison Officer, representing all of Shropshire and Staffordshire with the national Society for a number of years. At his funeral in October 1993, a tribute finished with these words: “To all who knew Syd through Amateur Radio, he was a friend, a companion, an expert in many specialist fields and a real gentleman who set the highest of standards.